Don\’t you love it when someone else cleans your house? I sure do – unless, of course, they “clean” it using products laden with nasty chemicals that leave my rooms smelling like antiseptic and that leave me with a big headache. That\’s why I was intrigued when Maid Brigade, a self-proclaimed green cleaning company, approached me with an offer to clean my house top to bottom in exchange for a no-holds-barred review of their service. In other words, they would do the dirty work; I would tell you how they measured up. WHAT IS A GREEN CLEANING SERVICE? Before agreeing to an appointment, I spent a long time reading through the Maid Brigade website. Having recently joined the Green Seal Advisory Council, I was particularly interested in a company that used many Green Seal-certified products. 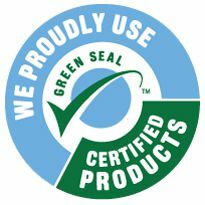 (Green Seal is an independent third party that has been setting scientifically-based standards for the environmental health and safety of consumer and industrial cleaning products for over 25 years.) I decided to make an appointment. I spent a good 15 minutes on the phone with a manager for the local Maid Brigade franchise, answering questions about my house. Did the sheets need changing? Did the fridge or oven need cleaning? Maid Brigade took detailed notes, then estimated how much time it would take to clean my abode. A couple of days before Maid Brigade showed up, I stopped doing the normal surface cleaning I do during the week. On the weekends, I drag out the vacuum cleaner and my usual cleansers – baking soda, a little plant-based and fragrance-free liquid detergent, some Bon Ami for a particularly stubborn bath tub ring or the toilet bowl. During the week, I sweep, dust lightly, or shake out a few rugs; I wipe down my kitchen counters every day. This time, I cut back to the bare minimum to let Maid Brigade show their stuff. Promptly at 8 a.m., two women dressed in Maid Brigade uniforms arrived at my home, carrying a vacuum cleaner, mop, and a couple of buckets filled with their cleaning products, reusable cloth rags and micro-fiber dusting cloths. They were friendly, cheerful, and very professional. (They were also “legal” immigrants who receive benefits from the company in addition to a paycheck.) They actually brought with them a “to do” list based on the conversation I\’d had when I booked the appointment. I showed them around the house, and they got busy. For the next three hours, the duo worked industriously, generally pausing only to ask me a question. They dusted dressers, tables and blinds, scoured the bathrooms, vacuumed the living room furniture and dining room chairs plus the wall-to-wall carpets upstairs and the area rugs downstairs. They also wiped down window sills and baseboards, washed the indoor windows and French doors on the first floor, and spiffed up the kitchen sink, counter and appliances (stove, microwave, dishwasher, refrigerator, toaster). Finally, they mopped the wood floors. Maid Brigade is a franchise company, which means that it has local franchisees that actually deliver the work. In order to be a Maid Brigade service, the franchisees need to be certified in the company\’s green cleaning system. I liked the idea that the company had established a strong protocol to ensure that all its employees delivered quality service. While the house cleaners were doing their thing, I was doing mine: reading the ingredients list on the bottles of floor polish, window sprays, and counter cleansers they were using. What I saw gave me pause. I was expecting to see Green Seal-certified products; instead, the ingredients list included questionable chemicals from Betco, a company I didn\’t recognize at all. I asked the cleaners to explain the discrepancy, but they really didn\’t know. My house sparkled. The windows shone. And when I gave it the “sniff” test, I didn\’t detect a single whiff of anything that might make me feel ill. Plus, because they had used cleaning cloths rather than paper towels, there was no trash to throw away. On the surface, Maid Brigade had done a tremendous job. But was it “green”? After the women left, I contacted Maid Brigade to find out what was really in their products. Cloud Q. Conrad, Vice President of Brand Strategies for Maid Brigade, Inc, said that the company uses mostly Green Seal-certified products, including the floor cleaner, glass cleaner, and peroxide cleaner, which they mix up from concentrates and use in the recycled Betco bottles to reduce waste. They also use a degreaser from Betco that is not Green Seal-certified, and their actual cleaning service is “Green Clean” certified, not Green SEAL certified. Using recycled bottles to mix up cleaning products is something I do myself at home; it makes sense to me both as a cost-savings measure and as a way to cut down on trash. But what about the company\’s “Green Clean” certification? With so many manufacturers claiming that their products are safe and environmentally friendly even when they\’re not, I am generally dubious of claims companies make about their own products. That\’s why I usually favor companies whose claims are verified by an independent third party. “We patterned our certification program after Green Seal\’s GS-42 standard,” she said, and sent me documentation from Quest, an independent lab, showing that “Maid Brigade\’s practices and standard operating procedures have the demonstrated ability to minimize chemical and particulate emissions associated with cleaning practices,” particularly compared to other (unnamed) commercial cleaning companies. While that doesn\’t mean they meet Green Seal\’s criteria exactly, it\’s pretty close. For good measure, I viewed a video Maid Brigade has produced that features Annie Bond, a long-time and highly respected advocate of non-toxic cleaning products, offering consumers tips on how to eliminate dangerous cleaning products in their homes. The video includes links to Green Seal, the Safe Cosmetics Data Base, and other organizations I respect as sources of reliable information on chemicals that consumers should avoid. Finally, I was impressed by the company\’s Green Cleaning Guide, which is something I could have written myself. As I sat in my nice, clean house, I realized that using a house cleaning company that sets high environmental, health and safety standards is very important to me. I think it\’s important to millions of other consumers, too. The more we learn about toxic chemicals, the safer we all want to be. For lots of us, that starts in our own homes. Whether I clean my house myself, or I hire someone to do it for me, I want the products used to leave no trace behind – not on a surface, not in the air. Second, using certified products and services is an important way to discourage greenwashing. I\’ve personally seen so many phony claims from co-called green companies that, whenever possible, I buy cleansers that are certified by an independent scientific body, not by the manufacturer. I\’m delighted that Maid Brigade uses mostly Green Seal-certified cleansers and follows a stringent process to train their staff in green cleaning practices. I hope other cleaning companies will pay attention – and follow suit. Big Green Purse website was named “2007 Best Green Website” by FutureNow. The site offers eco-lifestyle tips and shopping suggestions, as well as opportunities to join One in a Million, a campaign to encourage one million women to shift $1,000 of their household budgets to eco-friendly products and services. This article was previously published on Diane’s website.